and was placed first in her age group for all give events. 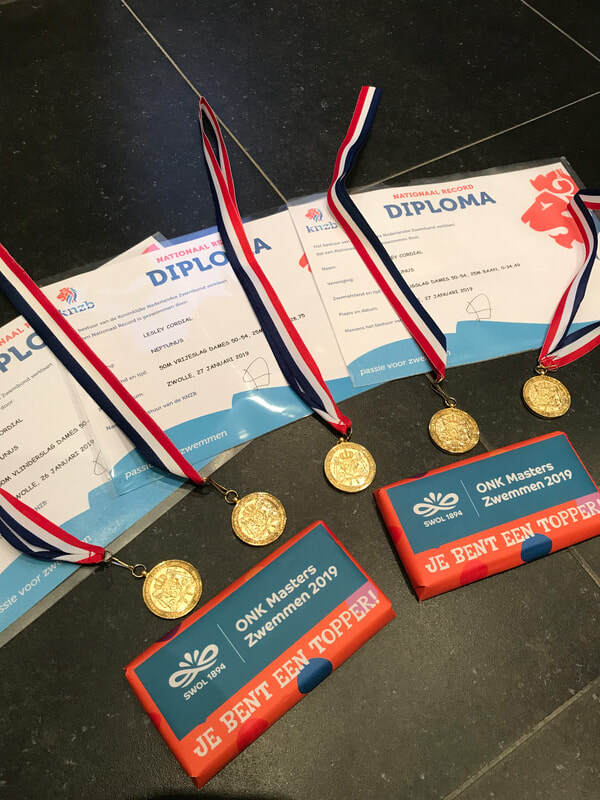 The meet was attended by over 2000 swimmers, the biggest entry they have ever had as Masters swimming gains in popularity in the Netherlands. 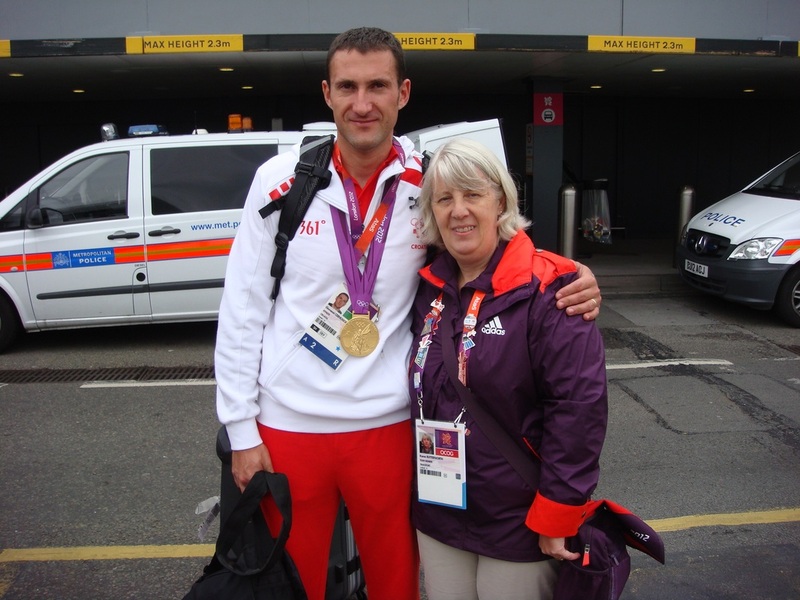 Lesley is currently training 2-3 times per week, 2,500m per session plus 1-2 running sessions plus gym / strength work and yoga. You can see her in Lane 1 occasionally when she swims with us on a Saturday morning or Sunday evening when on a visit to the UK for the weekend. Photo shows her five gold medals, the diploma you get for a new national record and the chocolate you get as an extra prize! 24 June 2018 - Ray takes to the air at Denham Aerodrome! 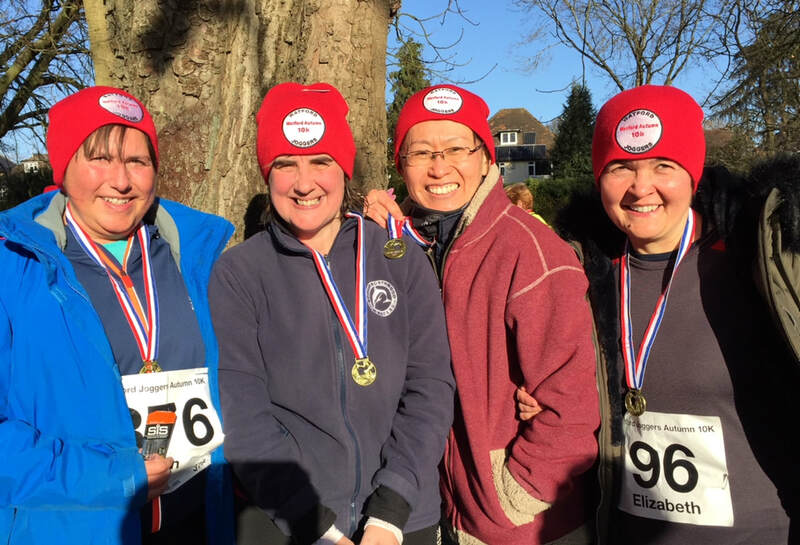 Well done to four RNSC Masters swimmers Ann, Fiona, Motoko & Elizabeth for completing this off-road course through Whippendell Wood, West Herts golf course and the beautiful Cassiobury Park. Great to see the Club badge on display Fiona! Swimming, running - what next ladies??? Elizabeth Harland of Lane 5 writes: We thought the Olympics were awesome! I have attached a photo that I thought might be good for the website. We bumped (almost literally!) into Missy Franklin at Heathrow Airport the day after the closing ceremony. She was most obliging when my daughters Grace & Molly wanted a photo with her! officials and IOC members who had travelled to London from all over the world. It was a fantastic opportunity to be part of the London 2012 Olympics, something that I will remember for many years! 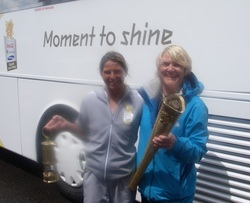 Jane writes: Anna was the medic for the Torch for two weeks. Yes, the torch needs a medic: well actually because about 350 people travel with the Torch it needs two medics!